So can anything be done so that you do not become one of those statistics returning home tail twixt your legs? I think so! The first thing that you must realize is that every single thing you do every day while living here will be different than it was before. Getting a haircut, stopping at the drug store, going to the cleaners, taking kids to schools, shopping for food or clothes, dealing with the metric system… everything will change. The key to all this is communication! Supermarkets, drugstores, dry cleaners here look about the same as they do “back home”. The difference is the language. If they all just spoke your native language like English, things would be great, right? To those who have visited Costa Rica or will do so prior to coming, you must remember that you will be living (or lived) in an bubble. You’re surrounded by English speakers and in some hotels, French and German speakers as well. This is the tourist Costa Rica and not the REAL Costa Rica. In the real Costa Rica, Spanish is the language, and to really get comfy here and enjoy the expat lifestyle, you gotta learn Spanish. There are numerous language courses, a few of which are advertised on the side of this page. The problem is that the good ones are not cheap. So with that in mind, I thought I’d introduce you to Coffee Break Spanish (CBS). 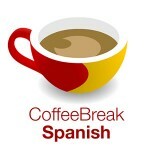 CBS is presented more or less free, and they take you from nothing to survival Spanish pretty quickly and easily. You can listen online, download the lessons to your computer or listen on your iPod or mp3 player. You can even burn them to a CD. So to all you future expats… start now and pick up the lingo. I cannot promise and 100% easy transition to Costa Rica, but I can promise it will go a whole lot smoother. A dear friend of mine visited the ‘resort circuit’ as a gift, with her son and daughter in law, in Dec.
She fell in love, and wants to live in Costa Rica. I agreed to go on a ‘real Costa Rica’ trip. We made no overnight plans, just picked up a reserved 4X4 SUV, and headed out from San Jose the 27th of March. We had a map of the country, and there were a couple of places she wanted to look into moreso. We visited Montezuma, Arenal, all around the Nicoya Peninsula – usually seeking out a ‘cabinos’ for the night. We went way into the hills, down to the water, up and down, here and there, and had a grand time. What an adventure we had. we are two seniors, and neither of us speak any Spanish to any extent but we did try to speak Spanish, and those we tried to communicate with,tried to understand, and the money part was pretty easy, because mostly they wanted ‘dollar’ amounts. and we just had he adventure of a lifetime, with only good news to report to you. Natives were surprised, happy, and helpful to see two older women travelling by ourselves. It really helped my friend to see the reality of Costa Rica, and she is still wanting to move there, but there are no rose colored glasses now. She will probably rent, and not buy, as property seems so inflated right now, and we paid attention to you there, as well. The places we happened upon were clean, very reasonable, and the owners very accomodating.